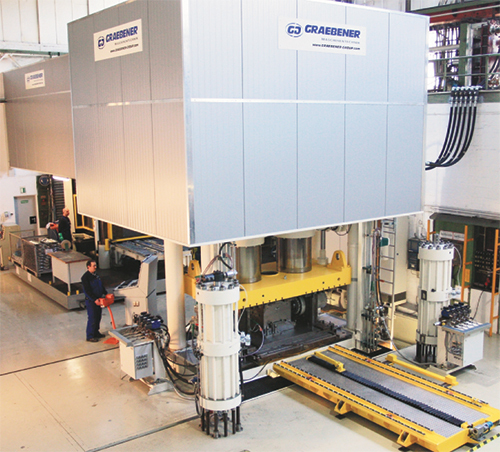 Graebener-Reika, Inc., (GRI), Reading, PA, a manufacturer of machinery for processing tube, pipe, bar, plate and sheet, introduces a new four-column hydroforming press through its parent company Graebener Maschinentechnik. The press is ideally suited for high-volume production, promising to double the number of parts produced in a single press stroke while cutting the per-stroke cycle time in half. The presses are available in closing forces from 800 to 5000 tons. The press crown and bed are connected to and clamped via four tierods, with the crown of the press supported by side columns. This column design offers the advantage of easy accessibility to the press and die area from all four sides.